An oritatami system is a novel mathematical model of RNA cotranscriptional folding, which has recently proven extremely significant in information processing in organisms and also controllable artificially in a test tube to construct an artificial structure by folding an RNA sequence. 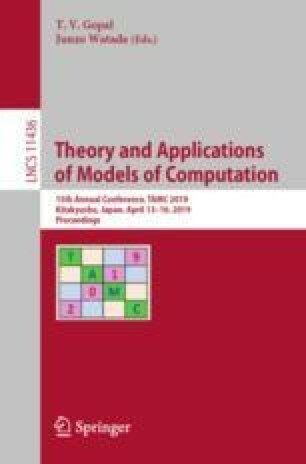 This model has turned out to be Turing universal. One next step is to simplify the Turing universal oritatami system and another is to characterize weaker oritatami systems as we may not need Turing universality for applications. In this paper, we look at oritatami systems that folds a unary sequence, and show that under reasonable assumptions, these systems are not universal. This work is supported in part by KAKENHI Grant-in-Aid for Challenging Research (Exploratory) No. 18K19779 granted to S. Z. F. and S. S. and JST Program to Disseminate Tenure Tracking System No. 6F36 granted to S. S.
We thank Yo-Sub Han for his valuable comments on the contents of this paper.